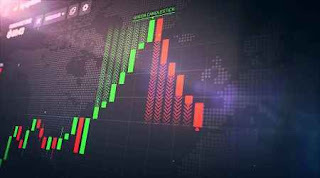 It is undeniable, candle pattern analysis is one of the effective trading methods and is popular with traders. Apart from being simple, the candle pattern is also useful in giving signals of further price movements. If we previously discussed the use of the inside bar and pin bar pattern, this time we will learn about how to use the tweezer pattern for trading binary options. Appears during an uptrend at the high price point. The first tweezer top candle is usually large and follows the previous trend, so it is a bullish candle. The tweezer pattern is considered to indicate a change of momentum that is strong, so it can be relied upon in the reversal strategy. This is reflected in the difference of two candles that form a tweezer formation: The first big candle is a picture of a strong price movement from the previous trend, while the second candle opposite the first candle shows that the trend is starting to stop, and there is a possibility that it will turn around. Then, how to apply the tweezer pattern in binary options? 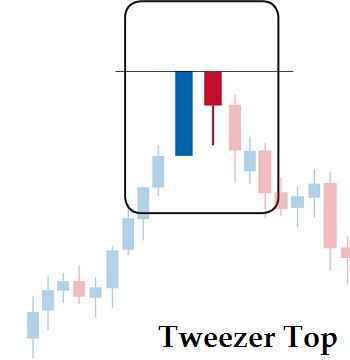 Simply put, we can just use the Tweezer candle pattern by way of trading reversals in general. For example, you identify a tweezer bottom formation in the downward trend in EUR / USD. In accordance with the bullish signal reversal pattern, you can prepare to open a "call" option. Conversely, when there is a tweezer top pattern at the top of the uptrend, the most likely possibility for you is to set the "put" option. In the chart below, the EUR / AUD trend is changing from an uptrend to a downtrend after the tweezer top pattern is formed. The option "put" opens at the open level of the bearish candle formed following the second candle in the tweezer top pattern. After getting the opportunity to enter, then you can just plan the exit position. Because in binary options the closing position cannot be done manually, only through expiry time, you need to be more careful in estimating the duration of the price decline. No need to worry, you can adjust expiry time with the time frame trading used. For example if you are trading with an H4 timeframe like the example chart below, then expiry time can be determined between 6 and 12 hours. Meanwhile, you can also get potential "touch" and "no touch" zones from the top tweezer pattern. First, mark the high level of the tweezer top pattern with a horizontal line (in the picture it appears as a white line). Then, set an area of 40 pips above the white line as the "no touch" zone. As for the "touch" option, the zone can be specified 40 pips below the line. Then what about the expiry time? For the "no touch" position, the expiry range set is more or less the same as the "put" trade above. But for the "touch" option, the expiry period should be widened to 12 to 48 hours. It can be seen that the placement of the "call" option can be adjusted to the bullish open candle level formed following the second candle in the tweezer bottom pattern. Meanwhile, you can also place a horizontal line on the low level of the tweezer bottom pattern, to get the "touch" and "no touch" areas. In the example above, the "no touch" zone can be placed 30 pips below the horizontal line, whereas if you open the "touch" option, the best recommendation for setting a zone that can be "touched" is 40 pips above the line. 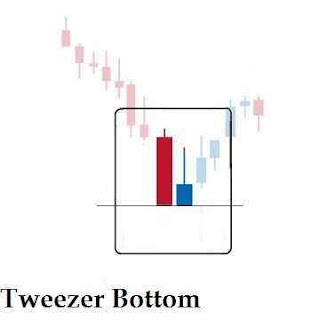 The selection of expiry time for strategies that use the tweezer bottom pattern is not much different from the advice on the tweezer top formation. The key, prioritize the time frame as the leading reference in determining expiry time. Because it can be used to open ordinary "call" or "put" options and touch trading, maybe now you are wondering, which type of trading is the best to use? Actually, there is no definite answer about that. The best type of option can depend on your market conditions or trading style. For example, the "touch" and "no touch" options are more suitable to use when market volatility is high, so if you prefer to trade in a quiet market, maybe you will be more suited to high / low trading using only the "call" option and "put". Regardless of the type of option used, the most important aspect of this strategy is actually recognizing the tweezer pattern itself. Why is that? Not much different from other strategies that use a particular candle pattern, there is a risk of fake signals if you are not careful in identifying tweezer patterns. Often a beginner makes a mistake in a hurry to take a step when he sees a candle pattern being formed, even though there is no other signal that confirms the formation. This certainly will greatly affect the success of your binary options trading. Actually applying the recommendation open "call" or "put" on the third candle after the tweezer formation is formed. This is the method suggested above. Actually, you can just open an option at the second close level of the candle. But this method is not recommended because the reversal has not been confirmed. So if you identify a chart with a tweezer top pattern which is a bearish reversal signal, you can wait until the next candle is formed. If the candle is bearish, then this can be a signal that strengthens your trading opportunity to open the "put" option. Using the help of support and resistance levels. The formation of a candle formation at important support and resistance can also be a convincing entry signal. In this case, you can observe the tweezer top patterns in the resistance area, and the tweezer bottom formation in the support zone. Pay attention to overbought and oversold signals from the oscillator indicator. You can also combine candle pattern analysis with indicators, especially oscillators that show overbought and oversold price signals. Overbought and oversold both indicate saturation levels which are also often used as reversal signals. Therefore, if the tweezer top is formed to coincide with the oscillator moving in the overbought level, you can make a confirmed signal to take the "put" option. And vice versa for the tweezer bottom, you can observe it along with the oversold signal from the oscillator.